Larry & His Flask is an interesting music specimen. The biggest advice I could give to an underground roots band right now would be, “Get away from underground roots if you want to grow,” and Larry & His Flask’s success is the perfect example why. Their 2011 stint on the Warped Tour and taking the time to do things right on the business side like plugging in the right people around them to help with management, booking, etc. has led them to become one of the few underground roots success stories. At the same time, their heart is still firmly ensconced in the mythos of what makes an underground band be able to connect so intimately with their crowd. They approach their music with incredible honesty, and they still reside in a “scene” of sorts, backing up songwriter Tom VandenAvond on his last two albums, and playing shows with artists like Possessed by Paul James and The Harmed Brothers. But it isn’t just because of logistics that Larry & His Flask have enjoyed growing crowds, it’s because they found an untapped vein of originality in roots music early on, and they put on one of the wildest, high energy live shows in music. Bluegrass, jazz, folk, blues, gypsy, rock, and whatever else come at you like a load of grape shot in a raucous, unparalleled explosion of musical enthusiasm. 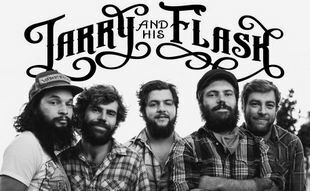 For the people that like to complain about the sameness of Mumford & Sons’ music, if you wanted to experience a mirror opposite of that, but a band in a similar stylistic direction, Larry & His Flask might be your best option. Just ask The Grateful Dead how tough it is as a notorious live band to translate that magic into the studio, but with Larry & His Flask’s latest album By The Lamplight, they accomplished this feat yet again. While giving The Flask’s last full-length album, 2011’s All That We Know top marks, I cautioned that bands that burn as hot as they do tend to run the risk of flaming out quickly, and in the long term, they would need to figure out new ways to keep their sound fresh. Well two years later and they’ve tempered their flame none, their sound still sits firmly within their original concept, and every song is still as enrapturing as ever and the band is showing no signs of losing momentum. But wild-eyed bands like Larry & His Flask can also be burdened by low ceilings. Like JD Wilkes once told me about his own band Th’ Legendary Shack Shakers who were also known for their crazy stage shows, the wild approach may win you some fast fans, but it can also keep you from the prime time of the music world. Though Larry & His Flask seem to have inexplicably never written a bad song, By The Lamplight, just like their other albums, fails to include that signature song or songs that can steel a band’s foothold in the music mind. Though in some ways this doesn’t matter. The Flask is such a force of nature they become greater than the sum of their parts. Spellbinding compositional attention is given to songs that carry an overarching theme about the wayward trajectory of man. It is a doomsday message that hides an underlying thread of hope and positivity, and a road map of how to focus one’s life on a more true purpose. The Flask’s wildness is a way to wake you from the drone of everyday events and offer you a new perspective, and By The Lamplight is like that beacon of hope and knowledge leading you through a dimming, disaffected world. 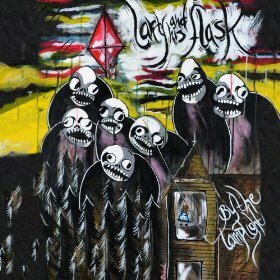 By The Lamplight is actually my favorite record of 2013 so far. I think it’s even better than their first album and that’s saying something. These guys are definitely in my top 3 to see at Muddy Roots with Dale Watson and Red Simpson. It’s all about who they are. Aside from being incredibly talented and entertaining, they are one of the most honest and friendly group of guys you are likely to meet. Every time I have seen them play it’s like meeting up with your long lost friends. It’s a great feeling that is not often duplicated. keep up the good work Larry’s! The primary lead singer and songwriter, Ian Cook, is my son and I’m proud as punch of all these boys. Thanks for the great review Trigger! Larry and his Flask is the best live-act I’ve seen since the first time I saw the Legendary Shackshakers. I’ve seen them 4 times now, travelled all over Holland for them, last week they would finally come to my town, but they had to cancel their tour. Unfortunally. I mean, I’m over 50 years old, but this music makes me go wild. When I first heard By The Lamplight, on my computer, I had some doubts, but when I got my copy and could listen full volume, the doubts disappeared. This is a great album, maybe just missing that one song to be picked up by radio. I love this band for the pure raw energy and the variety that Mumford doesn’t bring.